Recent models of Keurig coffee machines come with a K-Cup reusable coffee filter. This not only saves you a lot of money, it is also very convenient and easy to use. You can enjoy different brews of coffee without having to buy multiple K-Cups. It is also a great investment especially if you constantly need a fresh brew to start your day. In case you are planning to get yourself reusable K-Cups, this article will save your day. What you will find here are step-by-step instructions on how to use reusable K-Cups. We will also provide you some tips on how to make a better brew using your reusable K-Cups. Many of you might think that brewing a fresh cup of coffee using your Keurig coffee machine is a complicated task. It is not. With the basic knowledge in operating the coffee machine, you can do it a lot easier. Keep on reading the rest if this post and we will let you know how exactly and easy it can be done. 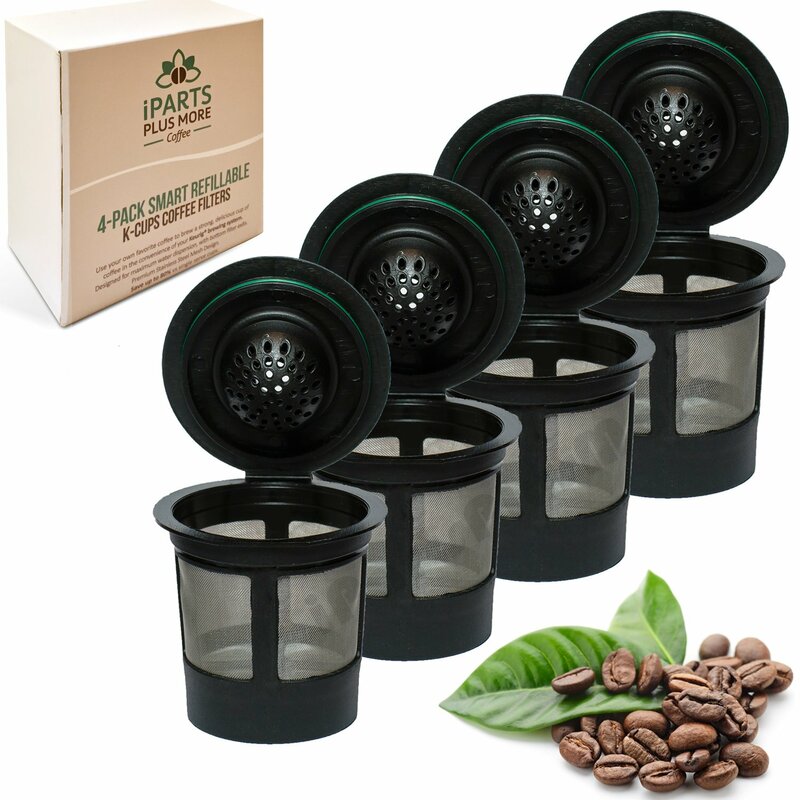 Generally speaking, here are some of the materials that you will need in order to make a cup of freshly ﻿brewed coffee using a reusable K-Cup. Before everything else, make sure you have the above materials first before starting to brew your coffee. This will save you a lot of time especially if you are always in a hurry in the morning. First, remove the black filter unit situated inside the Keurig coffee machine. To do this, lift the handle where the K-Cup is placed so you can remove the black unit. If this is not removed and if you just place the filter basket inside, your coffee will absolutely leak. You can now turn the Keurig coffee machine on by pressing the button you can find below the Brew button. You will see blue light that directs you to lift the top lid. A piece of plastic where you can see the cup sizes and ounces that you will need to make the specific size of coffee will be present in the water reservoir area. A measuring cup must be used to get the exact amount of water you will need. Recent models of the Keurig coffee machine incorporate a technology in which you won’t have to do this. Once you have the correct amount of water, you can pour it anywhere inside the reservoir area. You may now close the reservoir lid. You will then notice a blue blinking light that indicates that you have to open the K-Cup compartment. Lift the compartment’s handle so you can place the reusable K-Cup inside it. You have press down the K-Cup until you hear a click. This would mean that a hole in the bottom has been punctured to allow the water run to through it. You can now close the K-Cup compartment. After this, you can hear the sound of water gurgling down inside the machine. You have to make sure that you let the entire water pass through the reservoir. If you don’t, your ground coffee will not brew properly and you will not get a full cup of the brewed coffee. You must press the large Brew button after it has blinked and wait for your coffee to brew. You will notice that the blue light will alter to red, which is an indication that it is working. It would take around 30 seconds to a full minute for your coffee to brew. Other times, it only takes 15 seconds and you can’t press the button during that process. Take note that if you own a larger cup, you can freely disassemble the tray where the cup sits on. Press the small button you will find on the top left portion so you can slide it out. You have to let the filter basket cool. After, you can clean the wet reusable K-Cup so you can reuse it. If you want to clean it after brewing, you may remove the silver drain cover found at the top. It should be noted that if you put more water in excess of the 10-ounce limit, it would overflow to the drip tray. There won’t be any hints of overflowing until it floods your counter so you have to check the tray from time to time. For owners of Keurig coffee machine with water tank, here is the step-by-step instruction on how to brew your coffee. You have to put water into the tank. Select the desired size of coffee. You can do this by pressing down the button you can find at the top of the coffee machine. You have the option of putting one to one and a half tablespoons of ground coffee in the K-Cup filter along with 10 ounces of water in order to get a full-bodied cup of coffee. There isn’t a reason not to love the Keurig coffee machine and the reusable K-Cups because it let’s you brew your favorite coffee anytime. For better results, you may grind whole coffee beans until it becomes fine before making a cup of coffee. Most K-Cups hold 10g of ground coffee. 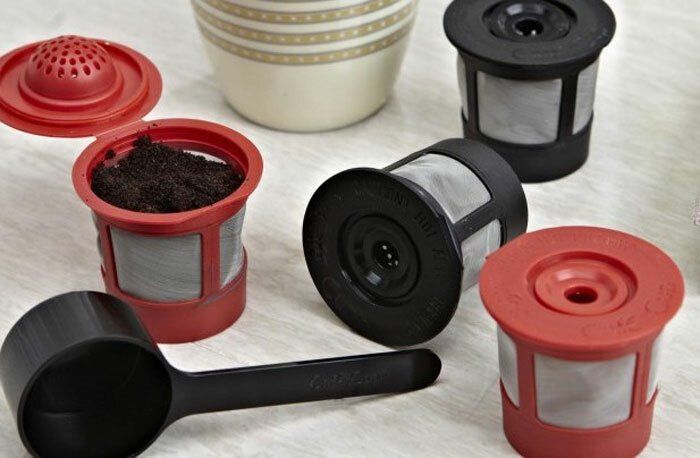 You may dismantle the reusable K-Cup by turning the lid counter-clockwise against the gray holder. You may now remove the silvery metal filter basket. Some Keurig coffee machine users find that unmodified K-Cups make a weak and watery brewed coffee. One way to prevent this is to save a used K-Cup and trim its top off. You have to remove the grounds from the used K-Cup and pull as much filter out. Using your scissors cut the lip’s upper edge, as well as the stray pieces of the paper filter and foil lid. You can now insert the reusable cup into the filter basket. Tap the ground coffee into the reusable K-Cup but remember to keep the coffee below at the top of the mesh. You should also avoid tamping the ground coffee. To summarize, knowing how to use reusable K-Cups is important as it allows you to save a lot of time and money. It is also considered environment-friendly because it does not produce a lot of waste. To add, it is important to be armed with this knowledge as it can save you a lot of time preparing your coffee on a busy morning. Did you enjoy reading this article? Do you own a Keurig coffee machine and tried using a reusable K-Cup? Was it easy? If you want to share your experiences, please leave a comment below.